The Mythic Keystone affix Grievous Wound now has a maximum of 4 stacks (was 5). Fixed an issue where Curse of Impotence cast by the Nexus Terror reduced the affected target's damage by much more than intended while Timewalking. Visions of Madness no longer strictly prefer to target ranged players with Mind Flay. The N’raqi Destroyer health reduced by 10%. Shockwave Stomp damage reduced by 20% on Mythic difficulty. Putrid Paroxysm damage reduced by 20% on Mythic difficulty. Mutated Mass and Corruption Corpuscle health reduced by 10% on Mythic difficulty. Gibbering Horrors health reduced by 10% on Mythic Difficulty. The number of Bursting Boils per cast reduced by 1 on Mythic Difficulty. Melee damage reduced by 10%. Black Hole Explosion damage reduced by 35%. The respawn time for all event world bosses has been lowered. In Mythic Keystone dungeons, the Grievous affix now stacks every other tick (was every tick), and now deals 2% of the player’s total HP per stack (was 1.5%). In Mythic Keystone dungeons, the health of Explosives has been reduced by 50%, and Explosives should no longer spawn from a crowd-controlled enemy. King A'akul's Hidden Blade Poison DoT reduced by 50%. King Timalji's Bladestorm snare increased to 60% (was 25%), and Bladestorm recast time increased to 20-25 seconds (was 10-20 seconds). Queen Wasi's Seduction duration reduced to 8 seconds (was 30 seconds). Shadow of Zul's Absorbed in the Darkness periodic damage reduced by 50%, and Shadow Barrage direct damage reduced by 25%. Shadow-Borne Champion's Ancestral Fury damage reduced by 50%. The Golden Serpent's Animated Gold health reduced by 50%. Deepsea Ritualist's Unending Darkness damage taken bonus has been reduced to 10% (was 25%), and cast time increased to 3 seconds (was 2 seconds). Tidesage Enforcer's Deep Smash impact damage reduced by 25%. Tidesage Spiritualist's now casts Mending Rapids every 25 seconds (was 10 seconds) and does 50% less damage with Anchor of Binding. Galvazzt's Galvanize periodic damage reduced by 25%. Faithless Tender's Embyonic Vigor healing reduced to 10% (was 50%), and Greater Healing Potion now begins cooldown immediately, allowing stuns to preventing it from being recast instantly. The Mythic Keystone timer is now set to 36 minutes (was 33 minutes). The Mythic Keystone timer is now set to 33 minutes (was 30 minutes). Oblivion Sphere now strongly favors targeting ranged specs across all difficulties. Fixed a bug that prevented earning the criteria for the Achievement Existential Crisis. Corrected an issue that was preventing players from receiving quest credit for “Breaking Irons” in Siege of Boralus on Mythic difficulty. Demonology Warlock Dreadstalkers will now correctly be able to attack MOTHER and will now properly grant charges of Demonic Core when they expire during the encounter. Fixed a bug that caused undesired tank swaps under certain conditions. Fixed a bug that could cause Lively Spirit (Azerite Trait) to continue to track spells after Innervate is removed from the target earlier than its normal duration, such as being removed by Purge or Dispel Magic. Lively Spirit's (Azerite Trait) Intellect bonus reduced by 30% when engaged in combat with enemy players. Fixed a bug that caused Sharpened Blades (Azerite Trait) to deal more damage than intended when engaged in combat with enemy players. Havoc no longer affects the Incinerate damage taken by its target after the Havoc debuff fades. "A Traitor's Death" no longer requires killing Hexthralled mobs. The Mythic G'huun title, Purifier, should now properly be available to alternate characters at level 120, once earned. Fixed an error causing Celestial Fortune to sometimes proc at incorrect times. Uuna's Starshot should no longer fail to depower Baa'l. No longer spawns Explosives in Mythic Keystone difficulties. Brother Ironhull will now remain stationary when casting Hindering Cleave. Whispers of Power now reduces maximum health as a percentage instead of restricting healing received. Manifestations of the Deep health reduced by 40%. Manifestations of the Deep's Abyssal Eruption damage reduced by 80%. Cross-realm raids can now enter Uldir on Mythic difficulty. Mythic Uldir is now listed in Group Finder. Spider's Kiss will no longer affect targets greater than level 69. The haste proc from the Construct Overcharger has been increased by 50%. Fixed a bug that could cause your first Packed House win of the day to not count towards the weekly brawl quest “Something Different”. Necrotic Aura, Heartstop Aura, and Decomposing Aura will no longer interrupt actions such as scrapping and crafting. Fixed a bug that caused Pure of Heart to remove Poison and Disease effects more often than intended with items and enchants such as Coastal Surge. Fixed a bug where Void Shift could cause the Priest or target to end up below 25% maximum health after the spell is cast. Cleansed Timberlings summoned from the Cleansed Timberling Heart now have a maximum level of 20 and can no longer be used in instances or Rated Battlegrounds. Fixed a bug that could cause a player who was online during a weekly reset to not receive a Mythic Keystone. Emissary rewards of gold now provide 2000 gold (was 700). Emissary rewards of Azerite now provide 1400 total AP (was 1000). On “Boarder Patrol”, Ornery Battleboars will now disappear in a huff if you hop off them. Reduced the number of explosive spawns on certain bosses in Underrot, Temple of Sethraliss, and King’s Rest on Mythic Keystone difficulty. Shade of the Horseman now scales up to level 120. The first Rated Battleground victory of the day now rewards 150 Conquest (was 100). Subsequent Rated Battleground victories now reward 100 Conquest (was 65). The first 2v2 Arena victory of the day rewards 35 Conquest, and subsequent victories reward 25 conquest (was 10). The amount of Conquest granted to the losing team in a Rated Battleground match has been slightly increased. Players who are “Saving Xibala” can destroy all Forsaken Blight Throwers, as intended. Light's Vanguard Battleplate 2-piece bonus reduced to 10% bonus Judgment damage (was 40%). Fixed an issue where Battlefield Focus and Battlefield Precision would incorrectly keep the player who applied them in combat when they are triggered by other players. Fixed an issue where Execute sometimes did not count towards activating Meticulous Scheming. Fixed an issue preventing some types of damage from triggering Impassive Visage. Legacy of Azj’Aqir 2-piece bonus Chaos Bolt cast time reduction reduced to 10% (was 40%). Fixed an issue that caused Laser Matrix to hit targets that were not in combat. Fixed an issue causing enemies on Zul's platform to be pulled into combat by some AoE damage procs. Azerite Veins (Azerite Trait) duration reduced to 9 sec (was 18) when engaged in combat with enemy players. Azerite Veins healing reduced by 33% when engaged in combat with enemy players. Frigid Grasp (Azerite Trait) is now removed from the Mage when Ice Form fades. Intellect granted by Frigid Grasp (Azerite Trait) is reduced by 66% when gained by casting Ice Form (PvP Talent) to match its reduced cooldown. Comet Storm damage reduced by 20% when engaged in combat with enemy players. Frostbolt damage increased by 15% when engaged in combat with enemy players. Meteor damage reduced by 20% when engaged in combat with enemy players. Fireball damage increased by 15% when engaged in combat with enemy players. All damage reduced by 6% when engaged in combat with enemy players. System Shock (PvP Talent) damage reduced by 33%. All damage reduced by 5% when engaged in combat with enemy players. Mana regeneration reduced by 30% when engaged in combat with enemy players. Healing Surge (Enhancement only) healing reduced by 33% when engaged in combat with enemy players. Roiling Storm (Azerite Trait) additional Stormstrike damage now diminishes per stack when in combat with enemy players. Mutated Masses will only spawn from one of the two central Waste Disposal Units on Mythic difficulty. Players are no longer prevented from using spells and abilities while holding the Power Matrix on Mythic difficulty. Dark Bargain can no longer cause players to become mind controlled on Raid Finder difficulty. Justice for the Fallen: Fixed an issue that could cause the Glaive to fail to award credit if used on G’huun during his death animation. Emissary caches that grant Azerite Armor can now reward items up to item level 370. Chronicler Ash'tar in Dazar'alor now offers the option to change loa statues between Krag'wa and Bwonsamdi. Converting a Festering Wound into a Necrotic Wound with Necrotic Strike (PvP Talent) will now correctly grant Festermight (Azerite Trait). Retaliatory Fury should now activate from abilities cast on friendly targets. The Fan of Knives radius increase granted by Flying Daggers (PvP Talent) and Fan of Blades (Azerite Trait) no longer stack. Fan of Blades effectiveness reduced by 75% when engaged in combat with enemy players. Fixed a bug that caused The Faceroller to be impossible to complete. Resolved an issue where credit for Expert Expeditioner was being granted in Heroic Island Expeditions. Fixed a bug causing Holy Paladins' Judgment debuff to be incorrectly consumed by other Paladins. Death Wish can no longer be cancelled. This was your wish. Fixed an issue where Darkmoon Deck: Fathoms could be triggered by non-damaging abilities. Fixed a bug causing the bonus damage from Shrouded Suffocation to fall off if the rogue used Garrote on another target. Fixed an issue where Steady Aim could not be applied to an enemy by multiple Marksmanship Hunters. Fixed an issue causing Retaliatory Fury to not proc correctly on heals on friendly players. Fixed a bug that caused players to be stuck at 99% progress towards the Season Reward mount (Vicious War Clefthoof/Riverbeast). "Pages of History" can now be completed. Image of Zardrax the Empowerer no longer evades during "Paybacks a Lich". Fixed a bug which prevented the weekly Call to Arms World Quests from displaying their 50 Conquest rewards. All damage increased by 4% (includes pets). All damage increased by 4%. All damage increased by 5%. Mind Flay damage increased by 10%. Mind Sear damage increased by 15%. Lightning Bolt, Chain Lightning, and Earthquake damage increased by 15%. All healing increased by 4%. Healing Surge healing increased by 6%, and mana cost slightly reduced. Shadow Bolt, Demonbolt, and Call Dreadstalkers damage increased by 15%. Vanguard now increases armor by 50% of Strength (was 45%). Vanguard increases Stamina by 40% (was 35%). Fixed an issue where Archive of the Titans was not stacking in combat unless the player was actively attacking an enemy. The incapacitate effect of Enhancement Shamans’ Sundering can now be removed by abilities such as Gladiator's Medallion and Ice Block. Creatures in Alterac Valley will now deal more damage and have more health for players at level 120 with higher iLevel gear. Demolishers now deal less damage to Siege Gunners and players. Damage done by Siege Engine against players has been reduced. During "The Hunt for Sylvanas", Tobias Mistmantle is now easier to follow. Fixed an issue where Rising Mist healed some targets that don't have the caster's HoTs. Resolved additional issues that could prevent players from gaining progress in Island Expeditions for the weekly quests Azerite for the Horde / Azerite for the Alliance. Fixed a bug that caused Spiteful Apparitions (Shadow Priest) to deal less damage than intended. Fixed an issue that unintentionally reduced the damage of Last Surprise (Unholy Death Knight) by 12%. Fixed an issue where Reorigination Array would sometimes not grant the appropriate amount of secondary stat. The ratio of Siren’s Pollen and Riverbud required for Battle Potion of Agility has been adjusted. Ingredients required to create Potion of Rising Death and Potion of Bursting Blood have been reduced. Minimum range required for Potion of Rising Death’s damage effect to reach full value reduced to 20 yards (was 30 yards). Murazond and the Ghouls in the Sylvanas encounter have had their health significantly reduced. High Priestess Azil’s Gravity Well no longer deals excessive damage. Fixed an issue preventing the "Lost Caravan" event from spawning in the Alliance version of Battle for Stromgarde. The Research option "War Resourcer" has been changed. It is now: Establish access to resources outside of the Warfront, allowing you enter the battle with 80 Iron and 20 Wood. “Nez'ara” should now properly reset when she has no enemies to attack. "Running Interference" should now reset properly. Coagulated Bloods roaming the halls of Uldir now inflict a maximum of 3 stacks Roiling Blood on Raid Finder difficulty. Fixed an issue where the Heartsbane Triad would not be able to cast Claim the Iris if the iris was not in line of sight. Fixed a bug where the player may remain stunned even if Soulbound Goliath’s Soul Thorns on them were destroyed. Sticky Tar now properly reduces the target's melee attack speed and auto-attack damage. Fixed a bug that caused Death Wish to only increase damage taken from Physical abilities, instead of all damage as intended. Players who are Away From Keyboard will now be automatically removed from the Warfront. Fixed a bug that caused the gryphon mount to disappear and prevent completion of “Saving Xibala”. Fixed some scaling and tuning issues with the Brewmaiden trinkets from the Coren Direbrew. Laser Matrix should now hit targets that are within striking distance of a typical ranged damage dealer, as intended. Thirsting Blades (Azerite Trait) additional Chaos Strike damage now diminishes per stack of its buff when in combat with enemy players. Fixed a bug that caused Warforged Timewalking items to not have the intended item level. Fixed a bug that prevented Azerite Power from dropping in Timewalking dungeons for players with a Heart of Azeroth. Increased player gear power, and greatly lowered damage and health of many creatures and spells in End Time. Timewalking vendor items now scale to item level 320 at player level 120. Legion Timewalking quests should no longer be offered by Archmage Timear in Dalaran. For the Battle for Azeroth Timewalking quest, seek out Chronicler Shoopa in Dazar'alor or Chronicler Toopa in Boralas. The criteria for Azerite Admiral, Tell Me a Tale, and Helping Hand should now combine progress from multiple characters on the same account. Please log in on every character that has progress toward these achievements to be credited. You can now whistle at Cap'n Crackers to have him ride on your shoulder. Starsurge and Starfall damage increased by 15%. All damage increased by 3%. Tremor Totem should no longer take an unintended amount of additional damage when players attack it. Conflagrate, Incinerate, and Immolate damage all increased by 10%. All damage increased by 6%. Ephemeral Recovery mana increased by 15%. Savior trigger threshold increased to 50% health (was 35%). Bone Spike Graveyard damage increased by 100%. Festering Doom damage increased by 25%. Eyes of Rage damage increased by 20%. Furious Gaze haste increased by 40% and duration increased to 12 seconds (was 8 seconds). Revolving Blades damage reduced by 35%. Thirsting Blades damage increased by 70%. Revel in Pain absorption increased by 20%. Craggy Bark absorption increased by 15%. Masterful Instincts bonuses increased by 10%. Dawning Sun damage increased by 40%. Sunblaze damage bonus increased by 35% against non-players. Iron Jaws damage increased by 66% against non-players. Gory Regeneration healing increase increased by 15%. Rapid Reload damage increased by 25%, and tooltip corrected to read “more than 2 targets”. Pack Alpha damage increased by 60% against non-players. Dance of Death agility increased by 20%. Unerring Vision critical strike increased by 100%. Focused Fire damage increased by 30%. Blur of Talons agility increased by 65%. Up Close and Personal damage increased by 40%. Galvanizing Spark damage reduced by 30% against non-players. Explosive Echo damage reduced by 35%. Frigid Grasp intellect increased by 100%. Packed Ice damage increased by 120%, and increased by 45% if used with Splitting Ice. Damage reduced by 50% against players. Glacial Assault proc chance increased to 20% (was 10%). Burst of Life healing increased by 20%. Open Palm Strikes damage increased by 60% against non-players. Dauntless Divinity block increased by 20%. Judicious Defense absorption increased by 10%. Divine Right strength increased by 40%, and duration increased to 15 seconds (was 10 seconds). Expurgation damage increased by 15%. Depth of the Shadows healing increased by 20%. Blessed Sanctuary bonus increased by 10%. Permeating Glow bonus increased by 15%. Spiteful Apparitions damage bonus is increased by 75% if you don’t have Auspicious Spirits talent. Searing Dialogue damage increased by 150%. Poisoned Wire critical strike increased by 50%. Sharpened Blades benefit from having multiple copies of this trait active has been reduced. Brigand’s Blitz haste increased by 50%. Blade in the Shadows damage reduced by 25%. Sharpened Blades damage reduced by 30% (unchanged in PvP). The benefit of having multiple copies of this trait active is reduced. The First Dance now grants 2 stacks of the buff, and critical strike bonus reduced by 25%. Strength of Earth damage increased by 60%. Roiling Storm damage increased by 100% against non-players. Soothing Waters healing increased by 10%. Executioner’s Precision damage increased by 75% against non-players. Test of Might strength reduced by 15%. Bloodcraze critical strike increased by 100%. Reckless Flurry damage reduced by 25%. Reinforced Plating dtrength increased by 10%. Dreadful Calling damage increased by 30%. Forbidden Knowledge damage increased by 66% against non-players, and the benefit of having multiple copies of this trait active is reduced. Umbral Blaze damage increased by 20%. Explosive Potential buff duration increased to 15 seconds (was 6 seconds). Accelerant duration increased to 12 seconds (was 8 seconds). Crashing Chaos damage reduced by 30% against non-players. Rolling Havoc duration increased to 15 seconds (was 10 seconds). Razdunk’s Big Red Button now deals 25% less damage in PvP combat. Last Surprise (Azerite Trait) effectiveness reduced by 35% when engaged in combat with enemy players. The healing of Rejuvenation, Swiftmend, and Wild Growth provided by Restoration Affinity is reduced by 30% when engaged in combat with enemy players. Regrowth healing reduced by 25% when engaged in combat with enemy players. Raking Ferocity (Azerite Trait) effectiveness reduced by 50% when engaged in combat with enemy players. All Restoration Druid healing reduced by 10% when engaged in combat with enemy players. Focused Growth increases the healing of Lifebloom by 15% (was 25%). Focused Growth reduces the mana cost of Lifebloom by 15% (was 40%). Grove Tending (Azerite Trait) effectiveness reduced by 25% when engaged in combat with enemy players. Damage done by the Hunter’s pet reduced by 18% when engaged in combat with enemy players. Latent Poison (Azerite Trait) effectiveness reduced by 30% when engaged in combat with enemy players. Mana regeneration reduced by 20% when engaged in combat with enemy players (was 30%). Focused Will decreases damage taken by 10% per stack when engaged in combat with enemy players (was 20%). Lava Shock (Azerite Trait) effectiveness reduced by 35% when engaged in combat with enemy players. Rippling Waters healing reduced by 33%. Riptide healing reduced by 15% when engaged in combat with enemy players. Spirit Link mana increased by 50%. Spirit Link now has a 1.5 second cast time and redistributes 25% damage (was 35%). Surging Tide (Azerite Trait) effectiveness reduced by 25% when engaged in combat with enemy players. Defensive Stance reduces damage dealt by 20% when engaged in combat with enemy players (was 10%). Lord of War (Azerite Trait) effectiveness reduced by 55% when engaged in combat with enemy players (was 40% reduced). Herbalists will now receive more Anchor Weed from nodes at rank 2 and 3. The ability Throw Rock should no longer one-shot targets on "Matchmaker". Resolved an issue that could cause the "Set Sail" to not properly display the quest objective. Overseer Korgus’ Incendiary Rounds’ damage and Blast Rounds’ pushback decreased by 25%. A new world quest has been added to win one Island Expedition. Click on the map and set sail for adventure! Some Island Expedition achievements have been made account-wide. Resolved additional issues that could prevent players from gaining progress in Island Expeditions for the weekly quest “Azerite for the Horde / Alliance”. Fixed bugs that were preventing Truffles in Stormsong Valley from behaving as expected. Ablative Shielding is no longer reduced by Stagger. The Weekly Quest "Something Different" can now be completed by participating in Shado-pan Showdown, as intended. “Something Different” now grants a 340 item level Dread Gladiator piece of gear from the Brawl Footlocker. Players who have already turned in “Something Different” this week can now complete it a second time. Fixed an issue where the "Pest Problem" did not count towards the Storm's Wake emissary. There are now a greater number of Ancient Texts that are “Past Due”. Casting Regrowth with Rampant Growth active and Innervate active no longer grants two stacks of Lively Spirit. Guardian Spirit can no longer heal for more than 200% of the Priest's maximum HP. Scarlet Fanatic’s Hands of Purity no longer deals excessive damage. Ticks now do less damage and spawn in smaller numbers. Unbound Abomination now spawns pools of Vile Expulsion around him. Corruption Corpuscle health reduced by 10% on Mythic difficulty. The bonus XP reward for completing a normal Island Expedition has been increased. The PvP Brawl first win of the day now properly awards 40 Conquest. The Seasonal PvP Mount now properly indicates you need Combatant Rated PvP rank or higher to earn it. Earthen Grasp now only affects melee hit chance, and no longer reduces spell hit chance. Skystep Potion and Lightfoot Potion will no longer drop shapeshifting forms, and shapeshifting while having one of these active will no longer cancel them. Last Defender now has a cap of up to 50% reduction in damage taken. Consume Essence cast time increased by 2 seconds. Abyssal Eruption damage decreased by 20%. Bursting Boils should no longer spawn close to the boss. The Frenetic Corpuscle now activates more often. Arcane Flurry (Marksmanship) buff duration increased to 10 seconds (was 3 seconds), and damage reduced by 45%. Archive of the Titans primary stat increased by 20%. Blood Mist (Feral) damage increased by 125%. Brain Storm (Arcane) Intellect granted reduced by 75%, and duration increased by 100%. Demonic Meteor (Demonology) damage increased by 200%. Feeding Frenzy (Beast Mastery) damage increased by 400%. Firemind (Fire) Intellect increased by 30%. Flashpoint (Destruction) Haste increased by 25%, buff duration increased by 25%. Frozen Tempest (Frost Death Knight) damage increased by 100%. Iron Fists (Windwalker) required targets reduced to 3 (was 4). Laser Matrix damage reduced by 30%. Natural Harmony (Elemental, Enhancement) secondary stat bonuses increased by 40%. Reorigination Array boss kill progress is now counted if the player is dead when the boss is defeated. Shrouded Suffocation (Assassination) damage bonus reduced by 40%. Simmering Rage (Fury) damage increased by 35%. Sudden Onset (Affliction) damage bonus reduced by 30%. Swift Roundhouse (Windwalker) damage bonus reduced by 55%. Thunderous Blast damage reduced by 35%. Hook Point Arena has reopened for play. Epic Battlegrounds now award bonus Conquest for first win of the day (was the first win of the week). Fixed a bug that caused Enlistment Bonus gained from participating in battlegrounds as a Mercenary to not increase Honor gain from some sources. The absorb granted by Mchimba's Ritual Bandages is reduced by 55% while engaged in combat with enemy players. The absorb granted by Xalzaix's Veiled Eye is reduced by 70% while engaged in combat with enemy players. Hydrocores now have a chance to drop off the final bosses of BfA dungeons in Heroic difficulty. [With weekly maintenance in each region] The strength of Vantus Runes has been reduced to the same potency they had in Legion. Developers’ notes: Vantus runes are a unique consumable that provide an extra boost when your raid group is focusing on a single boss. But if they’re too powerful, they can create a sense of regression as you try to re-kill the boss without their aid in subsequent weeks. Fixed a bug where Pa’ku could fail to appear as expected during “Zandalar Forever!”. Collecting Incandescent Duskwings or Crown of Torcali in a group now shares credit on “Alchemy is an Inexact Science”. Substantially increased the drop rates for the various bonus rewards, such as transmog items, pets, quest starters, and mounts. Starting next week, earning 500 Conquest in a week, regardless of the status of your weekly Rated PvP quest, will also make you eligible for a weekly PvP reward chest. It is strongly recommended that you complete a Rated PvP quest this week to ensure your eligibility for the next chest. Weekly Conquest rewards now display the correct item level inside PvP instances. All ranks of Battleborn Sigil and Warlord's Trophy should now function as intended and are usable on any Dread Gladiator's item of lower item level. Fixed a bug that made it possible to receive a lower item-level item than intended from PvP bonus rolls. Fixed a bug which caused the Shamanism versions of Bloodlust and Heroism to be unable to cast while you are the opposite faction in Rated Battlegrounds. Luminous Barrier's cooldown correctly resets at the end of a raid encounter. Reduced melee damage and Shockwave Stomp by 10% on Mythic difficulty. Reduced the health of Corruption Corpuscle and Mutated Mass by 10% on Mythic difficulty. Players that were affected by a bug that incorrectly granted Season 1 achievements on the first day of the season in American realms can now re-earn their Elite transmog unlocks by finishing an arena or battleground, if they have re-attained the appropriate PvP tier. Using Poison Dart on an Ankylodon no longer causes it to sleep so deeply that it doesn’t grant credit for “Cut Off Potential”. Fixed a bug sometimes preventing the completion of “Executioner Blackwell”. Shredded a bug preventing interaction with the Prototype Shredder MK-03 on "Put Away Your Toys". More Barbedclaw Grizzlys are now present for “The Barbedclaw Flank”. Last Surprise no longer gains the benefit of Mastery: Dreadblade twice. Deathbolt's damage now only counts up to the maximum base duration of your DoTs. Scrollsage Nola should no longer be killable, and should safely make it to the water whenever she chooses. Adjusted Defensive Beams to address an issue that could cause them to sometimes instantly damage nearby players on Mythic difficulty. Obliteration Beam no longer targets pets. Omega Vector periodic damage will now scale based on raid size in Normal/Heroic difficulties. Darkmoon Deck: Squalls will no longer trigger from spells that don't deal damage, such as Polymorph. Fixed a bug causing Spark Coil to linger on a player who changed zones. Hook Point Arena has been temporarily disabled. An issue was discovered causing some players to have an abnormally long load time while zoning into the arena. Cheat death type abilities such as Cheat Death, Purgatory, and Last Resort are now cleared when entering Arenas. Players who have earned Duelist: Battle for Azeroth Season 1 now have the weapon illusion 'Dreadflame' unlocked. Player pets polymorphed by Polymorph: Direhorn will no longer be giant baby dinosaurs. Death Chain's visual no longer lasts longer than its effect. Death Chain will now deal damage to other targets in the Death Chain when Bonestorm deals damage. Barbed Shot can now be removed by effects that remove bleeds, such as Stoneform. Execute modified by Death Sentence can no longer be cast out of melee range while rooted. Death Sentence will now only charge to your target when they are under 20% health (35% when talented into Massacre). Reflecting Prism can no longer be used on players under the effects of the Sea Mist Potion. Grasping Thorns should now despawn when their shapers are killed during "Goldfield's War". Fixed an issue that caused a second set of creatures to spawn in front of Priestess Alun'za for "Atal'dazar: From the Shadows". Players should now meet with more Bonebeak Scavenger Meat and Brineclaw Meat on “Instant Meat, Ready to Eat”. Primal Rage (Command Pet ability) should now correctly reset its cooldown at the end of an encounter. Dread Aspirant's Emblem and Dread Gladiator's Emblem maximum health value increased by 55%. Inoculating Extract healing increased by 44%. Lingering Sporepods healing increased by 140%. Mchimba's Ritual Bandages absorb increased by 190%. Revitalizing Voodoo Totem healing increased by 33%. Xalzaix's Veiled Eye absorb increased by 190%. Developers’ notes: We re-evaluated our guidelines for budgeting defensive and health-restoring effects in comparison to damage-dealing effects, and concluded that several such trinkets needed a significant increase. Fixed an issue where Blessed Portents would not trigger from self-inflicted damage. Synaptic Spark Capacitor (Druid) now correctly reduces the damage you take from affected enemies by 5%. Fixed an issue where Wild Fleshrending (Feral Druid) would not increase the damage of Brutal Slash. Inevitable Demise now functions in PvP. Command Pet will now properly change to the appropriate ability (Survival of the Fittest, Master's Call, Primal Rage) when entering Arenas. Grasping Thorns should now despawn when their shapers are killed during "Goldfield's War." Fixed a bug that caused daily Pterrodax raising quests to disappear after entering an instance. The Warfront queue now requires a minimum item level of 320. Unlocking the fifth tier of War traits now only requires defeating two unique enemy Warfront commanders (was three commanders). All healing spells increased by 3%. Rejuvenation mana cost reduced to 10.5% (was 11%). All damage reduced by 5%. Flamestrike damage increased by 15%. Holy Light and Flash of Light healing increased by 7%. Smite damage reduced by 9%. All healing reduced by 3%. Shadow Word: Pain and Vampiric Touch damage increased by 20%. Deadshot (Azerite Trait) reduced by 20%. Healing Rain healing increased by 12%. Riptide healing increased by 6%. Summon Darkglare damage reduced by 20%. Omega Vector will last longer with smaller raid sizes, lowering the number of forced Lingering Infection stacks per player. Fixed a bug where some shields and off-hands had a chance to Titanforge. Existing items that have dropped will not change, but new drops of these items should no longer have a chance to Titanforge. Fixed an issue where Rotcrusted Voodoo Doll did not scale correctly with Haste. Darkmoon Deck: Blockades will now shuffle more often based on Haste. Fixed a bug causing Inevitable Demise to give more additional healing than intended. Inevitable Demise bonus increased by 33%, and the benefit of having multiple copies of the trait active is reduced. Level 120 Water purchased from vendors is now usable in Rated Battlegrounds. Unrated PvP rewards now have a minimum of item level 300 at player level 120, and will improve with the player's item level, up to iLvl 325. Rake deals an additional 60% damage in PvP situations while Stealthed (was 100%). Shred deals an additional 35% damage in PvP situations while Stealthed (was 50%). Dire Beast: Basilisk now has a 60 Focus cost. Dire Beast: Basilisk damage reduced by 30%. Hunter Pet Basic Attack damage (Smack, Bite, and Claw) reduced by 30%. Aspect of the Beast increases the damage of your pets by 20%, down from 30%. Bestial Wrath increases the damage of you and your pet by 20%, down from 25%. Deadshot deals 30% less damage in PvP (was 45% less damage). Riptide healing reduced by 6% in PvP situations. Deep Wounds damage to enemy players reduced by 25%. Sharpen Blade increases Mortal Strike damage by 15% (was 30%). Lord of War (Azerite Trait) effectiveness reduced by 40% when engaged in combat with enemy players. Executioner's Precision (Azerite Trait) effectiveness reduced by 35% when engaged in combat with enemy players. Test of Might (Azerite Trait) effectiveness reduced by 30% when engaged in combat with enemy players. Corrected an issue that caused two sets of enemies to spawn in front of Priestess Alun'za on “From the Shadows”. Pestilent Pustules should now correctly trigger Runic Corruption Festering Wounds burst on enemy death. The heal over time from Tranquility is no longer shared between multiple Druids. Multiple Arcane mages Blinking in close proximity should no longer interfere with each other's use of Displacement. Hand of the Protector and Light of the Protector's healing bonus is no longer incorrectly affected by group size in some content. Regalia of the Skybreaker 2-piece bonus duration reduced to 1 second (was 3 seconds). Regalia of the Skybreaker 4-piece bonus reduced to 5% increased Flame Shock damage (was 40%), and Critical Strike bonus chance reduced to 20% (was 100%). Ludwig Von Tortollan's shell bounce damage has increased. Lowered the Enemy Forces requirement for Mythic Keystone completion by 10%. Terrible Thrash damage should now be consistent based on raid size. Orb of Corruption can no longer damage players after Zek’voz has been defeated. Corrected an issue that prevented Ahead of the Curve: G'huun from being properly awarded. Gibbering Horrors now have less health on Heroic Difficulty. Reduced the damage of Malignant Growth and increased the time between waves of Malignant Growth on Heroic Difficulty. Exploding Corruption now targets 1 player (was 3) on Heroic Difficulty. Horde players who have not unlocked the dungeon should not receive a Seige of Boralus Keystone. Increased the Enemy Forces contribution for Mythic Keystone completion from Heartsbane Runeweaver and Soulcharmer creatures by 50%. Fixed a bug where the Heartsbane Vinetwister wasn't counting towards Enemy Forces for Mythic Keystone completion. Players who received Khor, Hammer of the Guardian before it was hotfixed to an item level befitting a transmog item have had their powerful version restored. Disc of Systematic Regression should now hit large targets when you are in normal melee range with them. Ace Up Your Sleeve (Rogue) damage significantly increased. Blade in the Shadows (Rogue) damage provided slightly reduced. Indomitable Justice (Paladin) damage increased. Night's Vengeance (Rogue) damage increased against non-player targets. Relentless Inquisitor (Paladin) now persists for 12 seconds (was 10 seconds). Sudden Onset (Warlock) damage significantly increased. Thunderous Blast no longer starts with 1 stack of its own buff after delivering its guaranteed critical hit. Fixed a bug that was preventing some Champions from properly providing their bonuses when on Missions with Allied Race Troops. The Alabaster Hyena should now show up for Horde alts as well as be able to be set as a Favorite Mount. The Mecha-Mogul Mk II should now show up in your mount journal once learned. Fixed a bug that caused Random Epic Battlegrounds to provide incorrect rewards. Healer mana regen reduced by 30% when engaged in combat with enemy players. Streaking Stars (Azerite Trait) damage reduced by 50% when engaged in combat with enemy players. Arcane Pressure (Azerite Trait) effectiveness reduced by 50% when engaged in combat with enemy players. Galvanizing Spark (Azerite Trait) effectiveness reduced by 25% when engaged in combat with enemy players. Incanter's flow increases damage by up to 15% when engaged in combat with enemy players (was 20%). Mana Shield now drains 150% of damage taken as mana when damaged by enemy players and pets (was 50%). Overpowered causes Arcane Power to increase damage by 40% when engaged in combat with enemy players (was 60%). Rune of Power increases spell damage by 30% when engaged in combat with enemy players (was 40%). Glacial Spike damage reduced by 20% when attacking enemy players. Concentrated Coolness (PvP Talent) increases Frozen Orb damage by 10% (was 30%). Meridian Strikes (Azerite Trait) effectiveness reduced by 60% when when engaged in combat with enemy players. Sharpened Blades (Azerite Trait) effectiveness reduced by 65% when when engaged in combat with enemy players. Deadshot (Azerite Trait) effectiveness reduced by 45% when engaged in combat with enemy players. Turn the Tables increases damage by 10% (was 15%). Dispatch damage reduced by 15% when engaged in combat with enemy players. Killing Spree damage reduced by 20% when engaged in combat with enemy players. Between the Eyes damage reduced by 20% when engaged in combat with enemy players. Eviscerate damage reduced by 15% when engaged in combat with enemy players. Phantom Assassin (PvP Talent) increases critical strike by 10% (was 35%). Shadowstrike damage reduced by 10% when engaged in combat with enemy players. Arathi Highlands archaeology digsites are not available for players who are in the Warfront version of the zone. Speak to Zidormi to time travel to the previous version of Arathi Highlands. Battle for Azeroth alchemy potions are now correctly classified as potions when searched on the Auction House. Fixed a bug that prevented Uldir Vantus Runes from functioning as expected. "Confrontation at the Black Temple" can once again be completed. Fixed a bug causing Crimson Gnarlvine to go missing on "Kiro's Desert Flower". Fixed a bug that improperly prevented completion of some World Quests while the player was dead. Diabolic Raiment 2-piece set bonus chance to activate reduced to 4% (was 20%). Khor, Hammer of the Guardian is now item level 120 to signify that it is a Transmog weapon. Seafarer's Dubloon items may no longer be used in PvP Island Expeditions. Developers’ notes: We're looking for ways to use Dubloons in the future, but for the time being, we do not feel that Dubloon use makes for a good experience in a PvP setting. Demolishers and Siege Tanks have been tuned to do less damage, with longer cooldowns on several of their abilities. Stealth missions now only have two bosses or objectives to counter. Relentless (PvP Talent) and Hardiness (Orc Racial) no longer stack their Stun duration reduction effects. Fixed a bug that was preventing the weekly Conquest turn-in quests from being pushed to some players. Bonus Rolls for Rated Arena and Rated Battleground matches will now be removed when leaving the instance. The F.R.I.E.D., Organic Discombobulation Grenade, and Thermo-Accelerated Plague Spreader all now require fewer materials to craft. Rank 3 versions of their recipes should now also require fewer materials than Rank 2. Glyph of the Headhunter has been removed, as it is no longer a viable glyph. Fixed a display issue when interacting with the Injured Zandalari Soldiers on “The Road of Pain”. Fixed a bug causing Ji’arak and Warbringer Yenajz to fail to offer a bonus roll prompt in some situations. Fixed an issue that could cause "Save Our Scrolls!" to go away and not reappear until the player exited and re-entered Torga's Rest. Sabertron should no longer fail to spawn after you “Kill the Sabertron Technician”. Bracing Chill healing increased 10%. Brain Storm’s Intellect increased by 66%. Duration increased to 15 seconds (was 10 seconds). Everlasting Light healing increased 20%. Fungal Essence healing increased 15%. Gushing Lacerations’ Rip damage bonus increased by 37.5%. Martyr's Breath healing increased 50%. Niuzao's Blessing healing increased 100%. Shadow's Bite damage increased by 170%. Spouting Spirits healing increased 60%. Strength of Earth damage increased by 20%. Fixed Umbral Blaze to address an issue where its periodic damage could not critically strike. Also fixed an issue where its periodic damage would not correctly extend its duration if it was refreshed early. Unbound Chaos should now behave correctly on transports. Fixed an issue that prevented some players from reclaiming War Campaign outposts if they moved the character to a new World of Warcraft account. Demons from the Inner Demons and Nether Portal talent now correctly match the Warlock's level. Zooka no longer wanders around. Ludwig Von Tortollan's shell bounce damage has been increased. The Arrow Gauntlet is now less daunting on Mythic difficulty. Raal the Gluttonous now casts Tenderize earlier and more often. Additionally, his health has been increased. Fixed an issue causing the Briny Barnacle to gain too much benefit from the player's Haste. Disc of Systematic Regression damage and Vigilant's Bloodshaper damage reduced by 10%. Developer’s notes -- These two trinkets now deal 15% more damage for each additional target they hit, up to 75% increased damage if at least 6 targets are hit. The damage is still split among all targets. Their tooltips will not reflect this change until corrected in a future patch. Marie's Famous Cookies can now only be used in the outdoor areas of Kul Tiras and Zandalar. Fixed an issue causing the Risen Ravasaur from the Ravasaur Skull Bijou to not be able to critically strike. Fixed an issue causing the healing effect from Siren's Tongue to not be able to critically heal. Resolved an issue preventing additional characters on an account from being eligible for Arathi Highlands Warfronts quests. The Nightfallen quest “The Stuff of Dreams” no longer requires defeating Xavius in Emerald Nightmare. Kua'fon should now be available to accept "Nature Versus Nurture" or "Room to Grow". Torrention will once again arrive to slay you when you retrieve the Thelgen Seismic Record to start “The Floodsurge Core”. The number of Forsaken needed to complete "Emergency Management" has been reduced. On “Azerite Madness”, players will now get the correct amount of Azerite based on the number of enemies hit. The Sethrak have grown more courageous and will once again respawn after seeing countless numbers of their friends mercilessly slaughtered. In fact, they're bringing even more Sethrak in to try to get all the new “Azerite Mining” that's happening in the area. Fixed an issue causing Indomitable Justice (Paladin) to deal less damage than intended under some circumstances. Fixed an issue where Demon Hunters would sometimes prematurely fall to their deaths while Gliding away from Dazar’alor. Base energy regeneration increased by 10%. Berserk duration increased to 20 seconds (was 15 seconds). Brutal Slash energy cost reduced to 25 (was 30). Feral increase to Haste secondary stat value has been reduced to 25% (was 50%). Rip damage increased by 15%. Swipe energy cost reduced to 35 (was 40). Thrash energy cost reduced to 40 (was 45). Thrash damage reduced by 11%. Treasure Hunters around Deadwash will no longer inadvertently flag Horde players for PvP. There is now an NPC that appears at the end of Freehold that will port a player out of the dungeon. Overseer Korgus’s Heartstopper Venom now accrues 25% slower, and fully depletes over 2 seconds when the target is stunned by it. Algalon the Observer’s damage dealing abilities now do less damage. Merektha's Fang now applies Noxious Venom to targets every 1 second (was every 0.5 seconds). Reinforced Hide and Folded Steel Plating now properly reduce damage taken. Wormhole Generator: Argus will now be interrupted by taking damage. The Amber Rallying Horn now correctly increases the success change of Missions by 10% for each accompanying troop. Crafting Endless Tincture of Fractional Power and Surging Alchemist Stone will now provide an extra item when intended. Coastal Surge, Siphoning, Torrent of Elements, and Gale-Force Striking weapon enchants should now properly scale down in reagent costs as recipe ranks increase. The Interdimensional Companion Repository should now stack up to 20. Contracts now correctly have a 7-day duration. Profession World Quests should no longer appear on the map for characters who do not know that Profession. Tidesage Ritualists have been sagely taught their tidal ritual, and should no longer evade during "Tidal Teachings". “Beachhead” no longer causes nearby Protection Paladins to lose Last Defender. Fixed an issue causing Combined Might and Stronger Together to grant less Haste, Versatility, Mastery, and Critical Strike than intended when those respective buffs are triggered. Tranquility's heal over time is now visible to the caster on raid frames. Spectral Berserker now recasts Severing Blade after 8 seconds (was 4 seconds). Shadow of Zul’s Shadow Barrage direct damage reduced by 30%. All enemy casters now have mana bars. Viq’Goth’s health has been increased. It is no longer possible to outrange Hearstopper Venom. [With server restarts in each region] Azerite armor from Dungeons is now tradeable. Fixed a bug in which several trinkets were unintentionally breaking nearby crowd control effects. Many low-level items with effects that provide crowd-control such as Silence or Stun will now stop working at a level appropriate to the item’s expansion. Crafted foods now provide significantly more health and mana. Holographic Horror Projector will now properly break after an appropriate amount of damage has been dealt to the target. Holographic Horror Projector's fear effect is now classified as Magic and can be dispelled. Fixed a bug preventing Zolani from being available to complete “Evidence of Evil”. The Signal Falstad ability should be more reliably available to players who logout or leave The Great Sea while completing Chapter 4 of the Alliance War Campaign. Being hit by the Frightened Stomps of the Frightened Brutosaur during "Underfoot" will no longer flag players for PvP. Jammer no longer disappears when defeated in a pet battle, and no longer has other pets helping him in the pet battle. Several missing Zandalar mailboxes have been found and delivered to their proper locations. Players who have earned that Sweete booty by completing the Harlan Sweete encounter should now be awarded That Sweete Booty. [Following server restarts] The deposit for certain tradeskill goods has increased by 20% of the asking price of a single unit. This cost is constant, regardless of stack size. As with the standard deposit, this is returned to the seller when the auction successfully sells. Players that faction change will have Battle For Azeroth flight paths after the change. Players that change back to their original faction will have all of their learned flight paths. Feral Frenzy should more consistently deal its full damage and generate its full combo points, even if you move slightly out of range after casting. Hammer of Righteous splash damage correctly benefits from Last Defender and Avenging Wrath. Vathikur should now spawn once all pit snakes have been killed. Faction items can now be sold back to their Quartermaster within 2 hours for a full refund. Fixed an issue where Merektha's Fang could be cancelled by Remorseless Winter. Fixed an issue preventing Merektha's Fang from critically hitting. Merektha's Fang is now on the Global Cooldown, and its damage has been increased by 317%. Fixed an issue where Darkmoon Deck: Tides would sometimes activate less often than intended. The following items can now correctly be used to grant you their associated battle pets: Baby Crawg, Wind-up Frog, Ball of Tentacles, Undulating Blue Sac. Inland Croaker battle pets now have the correct Sticky Goo level 20 ability. Players are now directed back to Ata the Winglord when removed from the vehicle during "City of Gold". Fixed an issue where Brother Alen could become unresponsive during "Archived Knowledge". Auras no longer persist on players after completing “Beachhead”. The “Lost Goat” should now respawn as expected. Fixed an issue that was preventing “Stopping the Infestation” from starting properly. For “Cut Off Potential”, Zandalari Beastkeepers are now hostile to Alliance Allied Races, as intended. Horde players can now rest at the inns at the Blood Gate and the Diretusk Hollow. The Banshee’s Wail and Wind’s Redemption are now rested areas. Duplicative Incineration (Mage) damage reduced by 50%. Galvanizing Spark (Mage) Arcane Blast damage increase reduced by 10%. High Noon (Druid) damage reduced by 52%. Inevitable Demise (Warlock) no longer erroneously increases Drain Soul damage. Judicious Defense (Paladin) fixed an issue causing this trait to display two separate buff icons. Pressure Point (Monk) damage for Brewmaster reduced by 60%. Damage for Mistweaver reduced by 28.5%. Revolving Blades (Demon Hunter) now reduces your next Blade Dance by 3 Fury per enemy struck (was 5). Seismic Wave (Warrior) damage reduced by 58%. Shrouded Suffocation (Rogue) damage reduced by 11%. Fixed an issue that caused this trait's damage increase to fail. Swelling Streams (Shaman) healing reduced by 30%. Howling Blast's area damage should no longer deal damage through line of sight. Outbreak's explosion damage should no longer deal damage through line of sight. Swift Landing now works properly in Travel Form and stacks the movement speed buff with the Travel Form speed buff. The waters around the Ashvane Company Docks are now infested with Blood Crazed Sharks! Increased the rate at which Gale-Force Striking triggers by 100%. Fixed an issue causing Darkmoon Deck: Squalls' damage over time effect not to be affected by Haste or Critical Strike rating. Haste now causes it to trigger more frequently, and the damage over time effect can now critically hit. BoE items from low level areas should again scale more appropriately when they drop from creatures. Island Expedition shrine effects are now limited to Island Expeditions maps. Island Expedition consumable items now have diminished effects on PvP targets. Falstad and Valtois now correctly improve mission success chance with all kinds of Troops. “Blackrock Depths” should always be available upon completion of the War Campaign and reaching exalted with 7th Legion. “Vision of Time” should always be available upon completion of the War Campaign and reaching exalted with The Honorbound. Antitoxin will now be removed from inventory when turning in “They Want Us Alive”. Many Wanted: quests on the enemy continent now reward 7th Legion or Honorbound reputation. These quests have been reset for players who have already completed them. Part of the flight path during "Offensively Defensive” no longer goes through a tree. On “Beachhead”, Vicious Albatrosses will now devour turtles in a new, more glorious way... Avert your eyes, ye of faint heart. Fixed an issue where “Strange Egg” was disappearing while fighting Vukuba. Horde Scouts for the "Running Interference" should no longer interfere so aggressively. Members of the Alliance can no longer rest at the Temple of Akunda or Vulpera Hideaway. The inn in Dreadwash now grants rest. The Netley Inn in Stormsong Valley now grants rest. Ravenous Sandworms should now occasionally drop scales for Adept Sandfisher. Fixed an issue where Havoc Demon Hunters in Metamorphosis would not reliably trigger Meticulous Scheming. Power Word: Fortitude, Arcane Intellect, and Battle Shout are visible on raid frames (out of combat) to all members of the class who can cast them. Blessed Hammer correctly benefits only the casting Paladin. Fixed an issue with Faceless Tendrils in Atul'aman that caused them to ignore line of sight. Fixed an issue where a sister in the Heartsbane Triad could end up as the last witch alive and still have her damage reduction shield. Fixed a bug where the Heartsbane Triad could be considered defeated at incorrect times. Players should no longer be able to use the Electroshock Mount Motivator to motivate flight path mounts to move quicker. Wolfpelt Greatcloak now has the same amount of stamina as other, similar cloaks. Beguiling Orb can now be interacted with by multiple players at the same time. Ironfeather Armor no longer incorrectly increases the haste gained by Incarnation: Chosen of Elune. Xun Xun Sweetflower will now allow you to complete "Exotic Spices." Bumbles should no longer be missing from the Mildenhall Meadery for “Let’s Bee Friends”. Bear Heart and Caustic Sap now drop more frequently for “Bruin Potions”. A Horde flight path icon for Erika Jones is now present on the world map. The Fort Daelin Inn now grants rest. The Watertusk now grants rest to Alliance players. Binding your hearthstone to The Hozen Throne now refers to the player’s location appropriately as “The Hozen Throne”. Alliance players can now access all treasure chests for Treasures of Vol'dun. The spec restrictions on some Azerite traits have been loosened, to allow selection when the power of the trait can be utilized by a different specialization. Fixed an issue where Deathbloom (Affliction) did not properly affect detonations triggered by other Seed of Corruption explosions. Momentum talent will now properly increase the damage effect of Trail of Ruin. Brutal Slash damage increased by 20%. Swipe damage increased by 15%. Thrash damage increased by 15%. Berserk will now persist through shapeshifting into and out of other forms. Berserk will now shapeshift you into Cat Form if not already in Cat Form. Aimed Shot will no longer deal the 50% increased first attack damage bonus on the second Aimed Shot when using Double Tap. All Polymorph variants should now have the same duration. Fist of Justice now correctly reduces the cooldown of Hammer of Justice when spending Holy Power on Inquisition. Wild Imps will now always correctly cast five Fel Firebolts before despawning. Summon Vilefiend will now correctly summon a Vilefiend of the same level as the Warlock. The Brue in Stormsong Valley now has significantly less total health. The Tortollan Seekers at Scaletrader Post should now provide mail services to the Alliance in Zuldazar. Fizzie Sparkwhistle is no longer attackable. Knot of Snakes should now despawn when the Merektha encounter ends. Resolved an issue that could cause the staging timer to be hidden from some players on Island Expeditions. Increasing the staging timer to 45 seconds. Resolved an issue that was causing the enemy AI team to spawn too quickly. Players whose Heart of Azeroth did not receive its item level upgrade at Friendly, Honored, and/or Revered will now receive those upgrades by taking it off and re-equipping it. Ricocheting Inflatable Pyrosaw no longer ricochets quite so far. The Great Sea Ray mount should no longer be unique. Fixed a bug preventing players from receiving a message directing them to purchase the Greatwing Macaw and Mechanical Prairie Dog, after completing the associated quests. Players who have completed “Rodrigo's Revenge” or “Inspection Gadget” should visit Dana Pull in Boralus - and be sure to bring your polished pet charms! Creepy Crate will no longer creepily consume itself shortly after being summoned. Toxic Wasteling will no longer be stuck in place shortly after being summoned. Reduced the scaling benefits given to lower-level players in PvP. Horde and Alliance Bounty bags dropped by bounty targets now correctly grant 100 Honor. The "Call to Arms" World PvP quests can now be shared, and no longer require you to loot an Air Supply Drop to complete. Fixed a bug causing Genn Greymane to disappear on “Proudmoore’s Parley”. Brother Pike should no longer disappear for "Ritual Effects" and "The Strength of the Storm". Your name will no longer display as ‘Akunda’ when you enter Temple of Akunda after completing "Ending the Madness". Scout Mckellis is now available at the turn-in location for "Powder to the People" and "One Man Against the Horde". Horde players must now have World Quests unlocked to begin the Forgotten Cove quest line in Stormsong Valley. There are now an appropriate number of enemies in the area when “Azerite Empowerment” is active. Fixed a bug that prevented some players from being able to complete “Umbra’rix”. Gloom Hollow now provides Horde players with rest while in War Mode. Players who previously chose Pa'ku can now complete Raptari Rider after switching their loa to Gonk. Fixed an issue with Excoriate (Demonology) where gaining multiple stacks of Demonic Core at once provided no additional benefit. Fixed a bug where Raal the Gluttonous would not cast Tenderize in certain situations. Matron Alma's Dread Mark should no longer target pets. Resolved an issue that could sometimes cause players to not receive full rewards for winning an Island Expedition. Incessantly Ticking Clock procs now scale properly with item level. Razzdunk's Big Red Button meteor damage increased by 248%. Winning a PvP Pet Battle will now properly reward Polished Pet Charms. Fixed an issue where players who were eligible to unlock an Allied Race were unable to start associated quests. Fixed an issue preventing multiple players at a time from completing "What Remains of Marshal M. Valentine". Fixed a bug which made "A Chilling Encounter" show up incorrectly. Spineleaf will no longer disappear when defeated for "What Do You Mean, Mind Controlling Plants?". The Abyssal Beacon should no longer disappear from the player's inventory after death during "Light in the Darkness". “Walking in a Spiderweb” should no longer despawn some enemies before they can be looted. Fixed an issue where Dagger in the Back failed to stack properly when applied by multiple users. Players who faction transfer should now get a more informative message on how to continue the War Campaign on their new faction. The Summon Vilefiend and Nether Portal talents will no longer sometimes fail to work when cast on steep terrain. Fixed a bug that caused some enemies in the Drustvar Crimson Forest to be untargetable by players. Rikati at The Four Stingers will now sell his wares, including his famous Snake on a Stick, to members of the Alliance. Unlocking Siege of Boralus as a Horde player now unlocks the dungeon for all Horde characters on that account. Unlocking Kings' Rest as an Alliance player now unlocks the dungeon for all Alliance characters on that account. Irontide Enforcer's Shattering Toss will no longer wipe threat from the tank. Fixed a bug that caused players to sometimes become stuck with Grasp of the Sunken City. Fixed an issue where Darkmoon Deck: Blockades was providing far less Stamina and Health than intended. Fixed an issue where Darkmoon Deck: Squalls was dealing less damage than intended. Its effective damage has been increased by approximately 300%. Fixed an issue where Darkmoon Deck: Fathoms would not trigger for Marksmanship or Beast Mastery hunters. Reduced the damage of Darkmoon Deck: Fathoms by 9%. Sergeant Wilson has travelled to The Mugambala and will offer Mercenary Contracts to members of the Horde that wish to fight for the Alliance. Nassar has travelled to Hook Point and will offer Mercenary Contracts to members of the Alliance that wish to fight for the Horde. Fixed multiple bugs that made it very difficult to bomb targets successfully on “Swab This!”. Fixed a bug causing Third Telemancer Syranel to evade player attacks on “Grand Theft Telemancy”. Players should now reliably get credit for taking the ferry for "The Ashvane Trading Company”. Horde players should now properly be able to see the Stolen Supplies for "Plunder and Provisions." Legion Assaults have returned to the Broken Isles. Substantially lowered the Heart of Azeroth level required to activate the outer ring of Azerite armor obtained from World Quests and Mythic dungeons. Deathbolt will now correctly deal increased damage if cast immediately after casting Unstable Affliction. Slickspill should be much easier to loot now. Fixed an issue where 'Bygone Bee' Almanac's cooldown or duration would be affected too much when hitting multiple enemies. Sources of Conquest such as the World PvP Call to Arms quests, PvP Island Expeditions, Skirmish, and Battleground queues will award Honor until Battle for Azeroth: Arena Season 1 starts. Players who currently have Conquest will have the currency converted to Honor once they log in. Miniaturized Plasma Shield and Personal Space Amplifier engineering belt enchants can no longer be used in Arenas and Rated Battlegrounds. Fierce Gladiator is once again available to players who have earned the Fierce Gladiator: Legion Season 5 achievement. The War Mode Air Supply Drops in Tiragarde Sound should no longer fall in unreachable locations. Incendiary Brew now adheres to line of sight restrictions. Double Barrel will no longer stun targets multiple times per Keg Smash cast. Fixed a bug that prevented Pandaria Banquets from granting the intended skill levels to Pandaria Cooking and Way of the Grill. Fixed a bug that caused the miners to not respawn as intended for “A Shot at the Dark Iron”. Fixed a bug where missions required to unlock hubs on the other continent were expiring quickly. Riding Macaw is no longer unfriendly to Horde for the world quest "Swab This!". Hexlord Raal is now reliably present to offer “Pa’ku, Master of Winds”. Flight paths unlocked through missions should now reliably appear as valid destinations on the flight map. Fixed an issue where Ruinous Bolt would sometimes damage enemies that the player was not in combat with. 1 point of Mastery now increases Deep Wounds damage by 10% (was 1%). Damage of all Arms abilities decreased by 14%. This excludes Arms Azerite Traits. Da White Shark has turned a new leaf and has fully renounced the fighting tactic of beating someone with another person's body. Players should now always be able to see the reward treasure chest after defeating Da White Shark in the Grand Bazaar. Slickspill in Stormsong should now be much easier to loot. John J. Keeshan has decided to once again wield his old bow instead of the bow of a certain warchief. Fixed a bug where a group of players below level 110, when partied with a level 110 player in a Legion dungeon, would receive heavily reduced experience. Fixed an issue that caused Alliance players who had completed The Pride of Kul Tiras to be unable to access Siege of Boralus. Fixed an issue that caused Horde players who hadn’t completed Zandalar Forever to be able to access Kings’ Rest. Clarified the error messages shown when attempting to zone in to Kings’ Rest or Siege of Boralus without meeting the requirements. Salty Dog Crackers are now consumed on use. The Stormsteel Saber now has a level requirement of 120. Steel Strongboxes now drop Dread Aspirant gear for all valid armor slots during the offseason. Factionally-aligned guards should no longer attack you for attacking members of the opposite faction. Call to Arms: Vol'Dun will now correctly count Horde players slain while in Vol'Dun. The Forgotten Techniques of Kul Tiras/Zandalar items now properly restore recipes that were learned and subsequently unlearned. Fixed a bug preventing some Draenor profession books from properly teaching all introductory recipes. Digsites in the Port of Zem’lan are no longer partially obscured from view. Crafting Swamp Fish'n Chips should now give credit towards the achievements "The Zandalari Menu" and "The Kul Tiran Menu". Akan now teaches Battle for Azeroth Fishing. Fixed a bug that caused a few Tortollan quests in Stormsong Valley from awarding Tortollan reputation as intended. Completing "All Laid Out for Us" now awards its part of the Stormsong and Dance achievement. Upon accepting “Back to the Lab”, Raimond Mildehnall will no longer attempt to fight every enemy he sees while returning to the basement. Fixed an issue where the Lightforged Warframe used during "Dawn of Justice" was weaker than intended. Felecia Gladstone will now offer the remainder of her quests in Warfang Hold only once all her tasks for the Saltstone Mine have been completed. When unlocking World Quests in Zandalar and Kul’Tiras, Halford Wyrmbane or Nathanos Blightcaller will now give you a fresh Flight Master's Whistle if you left yours in the bank. Players are no longer stuck after abandoning “Into the Dunes” mid-flight. "Wanted: Anchorface" should now be available to Alliance players before they unlock World Quests. "Wiccaphobia" should now proceed as expected for players who group up with other players on the quest. Players may now complete "Spell Bound" after first completing "So Long, Sister". Lucille Waycrest should no longer disappear for some players on "Of Myth and Fable”. Eligible party members now receive Azerite along with “Azerite Mining” quest credit when a member of the party interacts with an Azerite node. Fixed a bug preventing some Inns from granting rested experience to characters in War Mode. The Royal Treasury in Dazar’Alor is now flagged as a rested area. The second floor of the Snug Harbor Inn is now flagged as a rested area. The Flight Master's Whistle can now be used on the non-dungeon island of Tol Dagor. Fixed an issue where the Azerite Trait Reckless Flurry was incorrectly increasing ability damage, in addition to auto attack damage. 7th Legionnaire's Tunic and Honorbound Outrider's Vestments now correctly have an Outlaw Rogue trait. The extra Subtlety Rogue trait has been removed. Fixed an issue where the Azerite Trait Wild Fleshrending was not increasing the damage of Swipe for Guardian Druids. Experience rewarded from end-of-zone dungeon quests has been greatly increased. Fixed an issue where players couldn't complete “Ecological Research” in The Temple of Sethraliss on Normal difficulty. Harlan's Loaded Dice now scales correctly with item level for its spells. Francois can now be properly summoned and used in Pet Battles by Alliance characters. Fixed a bug that prevented Peachy and Winkle from battling as intended. Fixed a bug that caused some digsites near Vigil Hill in Tiragarde Sound from providing fragments as intended. Crafting the Stormsteel Spear recipe now creates the correct item. Fixed a bug that prevented ore gathered in Kul'Tiras and Zandalar from being stored in certain bags, as intended. Fixed a bug causing one of the Shadra Betrayers to evade during "The Ancient One". Fixed a bug that caused the Ancient Gong to sometimes become unusable during “Punishment of Tal’aman”. Fixed a bug that made Taelia disappear under rare circumstances on “The Old Knight”. It should be harder to get separated from Rastakhan on "The King's Gambit". “Mine Sweeper” is now easier to locate and obtain. Goblin Mine Technicians aren't the tidiest bunch and may have left an extra Cracked Mine Sweeper in the Saltstone Mine. Players who disconnect before turning in "Dress to Impress" should now be able to properly see Flynn in the Dead Man's Tale. Fixed an issue where players could move during "Rest in the Depths", breaking the channeled spell. The Island Expeditions quest “Notched Coin” can now be turned in to Mili Wanderbrew. On “Return to Gloom Hollow”, players should no longer be able to get into a state where Titan Keeper Hezrel will not move. Fixed a bug that caused Avatar of Sethraliss to sometimes become inactive. Dune Scavenger is now usable by both Horde and Alliance characters. Terrified Pack Mule is now learnable and usable by Alliance characters. The Nazmir quest "Poisoning the Brood" will now share credit to party members. The Targets for "A Wall of Iron" will now respawn more frequently. Players that were in the vicinity of, but did not get credit for killing Vilank'dor, will once again be able to complete the quest "To Sacrifice a Loa". Fixed an issue where too many enemies were participating in "Mojambo". Players should now be able to advance and complete "The High Thornspeaker". Players who disconnect during “Rodrigo’s Revenge” can now continue the quest. “The Last Witch Doctor of Krag'wa” will no longer talk to nearby players who are not on the quest. Crawgs in "Crawg Free Zone" will now respawn more frequently. Adjusted the range of the Seaforium Smoke Grenade on “Boom Goes the Bomb” so that it can better go boom. Interacting with the Mysterious Brew during "Enforcing Fate" should now reliably grant credit. Fixed an issue that could cause players to be unable to select their second or third War Campaign Footholds. Players who had previously been stuck in this state may now interact with the scouting map near Halford or Nathanos to choose a Foothold. The Toad pet family ability "Swarm of Flies" will now continue to swarm around the Toad instead of staying in place. Hammer of Wrath’s impact visual should now appear on its target. All damage abilities increased by 3%. Breath of Sindragosa damage reduced by 12%. All Feral Affinity-granted abilities increased by 15%. Feral Affinity Energy regen bonus increased to 45% (was 35%). Lunar Beam will now correctly heal and deal damage while on an elevator. Holy Nova damage increased by 20%. All damage abilities increased by 8%. Crimson Tempest damage reduced by 10%. Subterfuge bonus reduced to 80% (was 100%). All damage abilities increased 4%. Fear mana cost reduced to 10% (was 15%). Summon Darkglare cooldown now resets at the end of encounters. All damage abilities increased by 5%. Alzzin the Wildshaper no longer deals excessive damage. Chromie’s health has been increased. Bastillax’s health has been decreased. The Blight Boar encounter in Darkmoon Faire is no longer more difficult than intended. Fixed a bug that was causing several trinkets to fail to proc when cast at max range. Light's Judgment deals 50% less damage when engaged in combat with enemy players. Light's Reckoning deals 50% less damage when engaged in combat with enemy players. Unholy Strength increases Strength by 10% when engaged in combat with enemy players (was 15%). Pillar of Frost increases Strength by 10% when engaged in combat with enemy players (was 15%). Wandering Plague (PvP Talent) damage reduced by 50%. Necrotic Strike's (PvP Talent) Necrotic Wound healing absorption reduced by 33%. Virulent Plague deals 10% less damage when engaged in combat with enemy players. Virulent Eruption deals 10% less damage when engaged in combat with enemy players. Focused Growth (PvP Talent) reduces the mana cost of Lifebloom by 40% (was 60%). Focused Growth (PvP Talent) increases the healing of Lifebloom by 30% (was 50%). Dire Beast: Hawk (PvP Talent) damage reduced by 40%. Careful Aim increases Aimed Shot damage by 50% when engaged in combat with enemy players (was 100%). Aimed Shot deals an additional 15% damage to targets you have not damaged yet when engaged in combat with enemy players (was 50%). Fists of Fury now deals full damage when engaged in combat with enemy players (was a 20% reduction). Righteous Verdict increases the damage of Templar's Verdict by 10% when engaged in PvP combat with enemy players (was 15%). Execution Sentence increases damage to the target by 15% when engaged in PvP combat with enemy players (was 20%). Word of Glory healing reduced by 20% when engaged in PvP combat with enemy players. Divine Purpose increases damage and healing by 20% when engaged in PvP combat with enemy players (was 30%). Hammer of Reckoning (PvP Talent) gains a stack when targets with your Greater Blessings take 2.5% of your maximum health in damage (was 5%). Vengeance Aura (PvP Talent) increases Holy Damage and Critical Strike chance by 3% per stack (was 4%). Vengeance Aura's (PvP Talent) duration reduced to 8 seconds (was 10 seconds). Sins of the Many increases damage by 8% when engaged in PvP combat with enemy players (was 12%). Trinity (PvP Talent) increases Atonement healing by 12% (was 20%). Archangel (PvP Talent) increases healing and absorption by 20% (was 30%). Edge of Insanity (PvP Talent) now properly reduces damage taken when at or above 90 Insanity (60 Insanity while talented into Legacy of the Void). Prey on the Weak increases damage dealt to the target by 5% when engaged in combat with enemy players (was 10%). Death from Above (PvP Talent) increases Eviscerate/Envenom/Dispatch damage dealt by 10% (was 15%). Fixed a bug that caused Creeping Venom (PvP Talent)'s duration to be refreshed to a longer duration than intended. Creeping Venom (PvP Talent)'s damage has been reduced by 50%. Deadly Poison deals 20% less damage when engaged in combat with enemy players. Vendetta increases damage dealt to the target by 20% when engaged in combat with enemy players (was 30%). Toxic Blade increases Poison damage dealt to the target by 20% when engaged in combat with enemy players (was 30%). Garrote deals 20% less damage when engaged in combat with enemy players. Subterfuge causes Garrote to deal an additional 50% damage when cast from stealth in PvP situations (was 100%). Plunder Armor (PvP Talent) reduces the target's max health by 10% (was 15%). Plunder Armor (PvP Talent) increases the Rogue's max health by 10% (was 15%). Thick as Thieves (PvP Talent) increases the damage you and your Tricks target deal by 10% (was 15%). Brigand's Blitz (Azerite Trait) is no longer gained from Control is King's Adrenaline Rush. Shuriken Combo increases Eviscerate damage by 3% per stack when engaged in combat with enemy players (was 5%). Night's Vengeance (Azerite Trait) effectiveness reduced by 66% in PvP situations. Spirit Link (PvP Talent) now redirects 35% damage to the team (was 50%). Spirit Link's (PvP Talent) mana cost has been increased by 12.5%. Spirit Link (PvP Talent) reduces the heal generated by Spouting Spirits (Azerite Trait) by 80%. "Continue Your Training: Master Woo" and its corresponding daily quest have been temporarily removed. Gorefiend's Grasp correctly functions on transports such as elevators. Risen Skulker from All Will Serve will now properly change targets to assist while in combat. Summon Gargoyle and the Dark Arbiter variant will now properly assist in combat and change targets. Succubus will no longer automatically cast Seduction when the Warlock is affected by crowd control effects. Dresanoth’s Icy Talons ability no longer deals excessive damage. Lylth the Silent no longer deals excessive damage with Lunar Blast, Shadow Blast, and Star Barrage abilities. Lieutenant Silvermight no longer deals excessive damage. The number of bases controlled by each faction is now displayed correctly. Fixed a bug that made Frost Lotus require a Herbalism skill of 400 to be successfully harvested. Fixed display issues with Void Elf Heritage Armor and Shadowform with Glyph of Shadow. Isle of Conquest Airship Cannon's ball of fire visual should again match the actual trajectory of the shot. Raise Dead's Claw ability will no longer incorrectly gain damage from Mastery: Dreadblade. The Dark Transformation upgrade to Sweeping Claws still benefits from Mastery. Sunfire will no longer apply to secondary targets that are immune to its effects, such as Rogues with Cloak of Shadow active. Photosynthesis now increases rate of all HoTs by 20% (was 15%). Photosynthesis haste effect now affects Efflorescence. Cultivation healing reduced by 17%. Rejuvenation healing increased by 6%. Mana Shield drains 50% of damage as mana (was 20%). Phoenix Flames's single-target damage now correctly hits Totems and similar targets. When using Concentrated Coolness, the Regalia of the Arcane Tempest 4-piece set bonus will properly reduce the cooldown of Frozen Orb. Chi Wave healing increased by 25%. Renewing Mist healing correctly generates threat. Blackout Kick damage reduced by 27%. All damage abilities have been reduced 3%. Smite damage reduced by 6%. Divine Star healing increased by 25%. Shadow Word: Pain reduced by 9%. Shadowfiend damage reduced by 16%. Mindbender damage reduced by 8%. Fixed a bug where Sins of the Many was not increasing Atonement healing from Shadowfiend/Mindbinder. Binding Heal now costs 2.4% of mana (was 2.0%). Holy Word: Salvation cast time increased to 2.5 seconds (was 2 seconds). Angel's Mercy cooldown reduction increased. Cloudburst now stores 30% of healing done (was 25%). Unleash Life instant healing increased by 26%. All damage abilities reduced 4%. All damage abilities reduced 3%. Summon Darkglare will no longer remove all nearby Rogues from stealth. All damage abilities increased 3%. Myra Tyrngaarde was having some trouble understanding how to cross the bridges in Ironforge, but she's been shown the correct path. Fixed a bug preventing Guild ranks with invite permissions from properly inviting. Fixed a bug that caused Guild and officer note updates to be delayed if the member was offline. Fixed multiple bugs that caused some players to be unexpectedly removed from General and Trade chat channels. Remorseless Winter now has the correct amount of Global Cooldown reduction applied from Haste. The talent Inexorable Assault will now correctly always deal damage when using Obliterate or Frostscythe. The Spell Eater talent will now correctly modify the absorb value of Anti-Magic Shell. The in-combat behavior of the Risen Skulker from the All Will Serve talent has been adjusted to work similarly to other ranged combat companions. Cloak of Shadows will now correctly clear any Hunter's Mark debuffs from the Rogue when activated. Rain of Fire should no longer incorrectly pull creatures who may be on a different floor or are otherwise out of line of sight. Fixed a bug that caused Death Wish to reduce the cooldown of Recklessness when talented into Anger Management. The Prophet Velen no longer deals excessive damage. It should now be less difficult to defeat Patchwerk in the Death Knight starting zone. Elder Stormhoof should no longer be quite so deadly when Blessed by Earth. Fixed a bug that caused several enemy abilities to hit tanks for more than the intended amount of magic damage. Relic of the Makers again grants Agility, Intellect, and Strength as intended. The sound of Hot Buttered Popcorn no longer travels far across zones. The effectiveness of Resilience on low-level PvP gear has been greatly reduced. Players who become Bounty Hunted are now be provided with a parachute if they happen to be on a flying mount. Flag captures, bases assaulted, and bases defended are now in the correct order on the scoreboard. Fixed a bug that could cause multiple Azerite nodes to be spawned at the same location at the same time. Hi-Explosive Trap will now adhere to AoE knockback diminishing returns when interacting with spells such as Shining Force and Thunderstorm. Blessing of Sanctuary can now be cast on low-level player targets. Darkmoon Faire Island now requires Fishing rank 150 to avoid catching junk (was 600). Fixed an issue that prevented some players from progressing in the Rogue class hall campaign. Quest targets in the Spires of Arak Howling Crag no longer permanently evade when straying too far from their spawn locations. The snare effect from Grip of the Dead will now correctly be reapplied to a target standing in your Death and Decay or Defile area if the snare is removed. Blizzard damage once again correctly reduces the cooldown of Frozen Orb. Offhand hits from Killing Spree are no longer able to activate Main Gauche. Regalia of the Dashing Scoundrel 2-piece and 4-piece bonuses now work properly with the Secret Technique talent. Witch Lord Morkurk's health lowered by 60%. Corrected a bug that caused the vendor Misty Merriweather to require an impossibly-high level of Leatherworking for her offerings. Talador: Artillery Strike gained from picking the Artillery Tower now properly inflicts damage and stuns like it used to. Glacial Advance will now properly work when used on an elevator. Apotheosis (from The Alabaster Lady) no longer affects Holy Word: Salvation. Liquid Magma Totem, Stormkeeper, and Ancestral Guidance will now cause you to shapeshift out of ghost wolf form. Ravager will now correctly deal damage to enemies who are on elevator. Gruul should again drop the Earthen Signet in for “Cudgel of Kar'Desh”. Reduced the damage of the summoned imps during “Fire at Will!" Fixed an issue that could prevent players from accepting the Pandaren quest "Joining the Horde". Lunar and Solar Empowerment buffs will now show up on your Personal Resource Display bar. The Fury of Elune talent will now properly deal damage to targets who are on an elevator. The Nether Portal talent will now correctly work on elevators. The Bilescourge Bombers talent will now properly display all of its visual effects when on an elevator. Sirana Iceshriek’s Ice Shriek should no longer deal excessive damage. Fixed a bug causing some Booty Bay Bruisers to deal excessive damage. High Warlock Xi'lun no longer deals excessive damage. Reduced the damage of several creatures in Gordok Commons. Players should now correctly return to their bodies when they die while dreaming. Many of the abilities used by enemies in the Halls of Origination now deal reduced damage. Sunblade Imp’s Firebolt now deals more reasonable damage. Lord Aurius Rivendare now takes expected damage from players. Steelforged Essence should again work on shields. The Epic Battleground queue should now be available at level 20. PvP trinket items that remove loss of control effects such as the Inherited Insignia of the Horde now share cooldown with PvP Talents such as Gladiator's Medallion. PvP trinket items that remove loss of control effects such as the Inherited Insignia of the Alliance can no longer be used if the player has learned Adaptation or Relentless. Arcanomancer Vridiel should once again sell the recipe for Rethu's Incessant Courage. Ji Firepaw no longer follows the player after completing “The Horde Way”. Players unable to speak to Sylvanas during the quest "Killer Queen" should once again be able to do so. 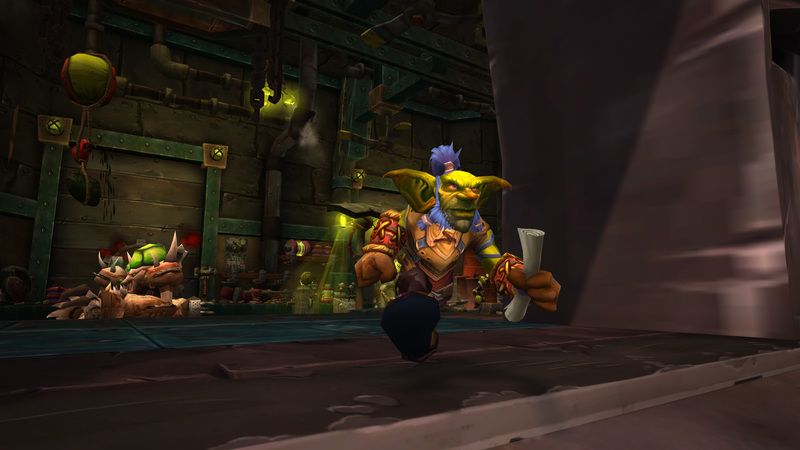 The infected goblins for "Curing With Force" are now a little more resilient to allow players to apply their cure. Razor Hill Watchtower is no longer a sanctuary. Dancing Rune Weapon now deals the correct amount of damage when using Heart Strike. Hunter's Mark will no longer break you out of the effects of Camouflage. The Trick Shots buff will no longer be applied to a Hunter below character level 50. The Vestments of Blind Absolution 2-piece set bonus now properly benefits Shadow Word: Void and is consumed when you cast Shadow Word: Void. Soul Siphon no longer absorbs an excessively high amount. Ley-Guardian Eregos’s Arcane Barrage and Greater Ley-Whelp’s Arcane Bolt should no longer deal excessive damage to players on drakes. Fixed a bug preventing players from interacting with the Portal Energy Focus in some circumstances. Horde and Alliance Bounty Bags from players who are 'Bounty Hunted' and then killed are now lootable by up to 5 players (was 1 player). Keep Cannons now deal significantly reduced damage to vehicles. Siege Engines are now immune to all snares and roots. Health of Glaive Throwers and Demolishers increased. Damage and siege damage of Airship Cannons significantly increased. When any gate is destroyed, the corresponding faction loses 50 Reinforcements. Namha Moonwater should once again teach the two legendary Leatherworking recipes. Highly Explosive Yaungol Oil again deals an appropriate amount of damage on "The Enemy of My Enemy... Is Still My Enemy!" Legion Season 3 and 4 Combatant Ensembles now have the required level of 110 and the correct expansion requirement, allowing you to transmog to the appearances at level 98. Fixed a bug that was preventing some Bonus Objectives from correctly displaying on the world map. The experience required to level has been lowered for all levels from 40-100. The reduction averages 14% between levels 60-80, with smaller reductions at other levels. Rushing Jade Wind will toggle off if the player has not auto-attacked any target for one minute. Fixed a bug causing Spirit of Redemption to be triggered when the fatal damage should have been redirected by spells. S.A.F.E. operatives should again be using their guns correctly. Lady Malande’s Reflective Shield no longer reflects too much damage. There should no longer be a floating Drogbar on patrol. Speaking with the Image of Medivh should again properly spawn Arcanagos and begin the Nightbane encounter. The guild achievements Working as a Team and Working Better as a Team no longer require First Aid. To celebrate the post-season, the Southshore vs Tarren Mill Brawl will be active this week, outside of the normal Brawl rotation! Every Man for Himself will now properly cause a 90 second cooldown on similar effects such as Adaptation and Gladiator's Medallion. Will of the Forsaken, Stoneform, Fireblood will now properly cause a 30 second cooldown on similar effects such as Adaptation and Gladiator's Medallion. Players that earned Rival: Legion Season 7 should receive the Rival title. Flying Carpet should be obtained from Northrend Tailoring trainers instead of the Outland trainers. The bounty board for “Wanted: Hogger” went missing, and has been found and put back in its place. Fixed a number of issues with voice chat on Mac operating systems, including support for the use of most keys as hotkeys. Melee and spell damage of creatures below level 100 reduced by up to 16%. Health of creatures between levels 15-100 reduced by up to 24%. Developers’ note: These changes are live in-game, however unit frames may not fully reflect the new health values until a subsequent companion hotfix that we plan to apply next week. Fixed a bug causing Serpent Sting to sometimes not correctly fire additional arrows at nearby targets when talented into Hydra’s Bite. Command Pet should not get overridden with Primal Rage unless the Hunter (and pet) are at least Level 65. Command Pet should not get overridden with Master's Call unless the Hunter (and pet) are at least Level 74. Fixed an issue where Incanter's flow sometimes falls off during combat. Fixed an issue that caused Spirit of Redemption to sometimes trigger incorrectly while other absorbs were present on the Priest. Fixed an issue that caused Flash Flood to sometimes fail to apply its buff. Flying Tomes are no longer flying out of reach. Titanic Bulwark no longer absorbs more damage than intended. Stormchops should now deal reasonable damage. Eonar's Compassion’s effect, Eonar's Verdant Embrace, now triggers from Power Word: Shield for Discipline Priests. Uuna's accessories should now display correctly. Players can again initiate the pet battle for "Help a Whelp" in Azsuna. Resolved an issue with Temple of Kotmogu's scoreboard displaying Victory Points and Orb Possessions. Alterac Valley and Isle of Conquest Reinforcements increased by 100. Gate health reduced by 20%. Demolishers now deal more siege damage against gates. Significantly increased Siege Engine player damage. The Quarry and the Refinery now give additional reinforcements more frequently. Reanimation's explosion should now be more responsive when striking moving targets. Effects from Control the Mists should no longer persist after removing the talent. Fixed a bug that caused Rot and Decay to function with Drain Soul. The Alchemist Flask should now appear in the correct expansion category and no longer require Pandaria Alchemy to use. Tanithria should now once again teach Celumbra, the Night's Dichotomy to tailors. Storm Brew Grenades now deal damage for “Storm Brew Hustle”. Fixed a bug that was preventing the completion of the questline that started with captain Sanders’ Treasure Map in Westfall. “A Village in Peril” can again be turned in to Mayor Heathrow. The Mount Hyjal achievement Bounce should now function properly. The Deadmines meeting stone has been found and returned to its proper placement. Serpent Sting's periodic damage is now able to critically strike. Kill Command's periodic damage is now able to critically strike, when talented into Bloodseeker. Chi Burst correctly travels its full 40-yard range. Dragon Roar should generate threat as intended. Vile Tutors’ Shadow Shields no longer shield them too much. A number of creatures in Darkshore can now be skinned, as intended. Frigid Nova no longer inflicts excessive damage. Armsmaster Harlan's Blades of Light should release players on completion. Anub’arak’s Pursuing Spikes again pursue with an intended speed of pursuit. Players should now have "Research: Ink of the Sea" which will allow progress in the Northrend Inscription skill. The ability "Research: Ethereal Ink" should now appear in your recipe list for those who have Outland Inscription learned. Garrosh should again properly throw Overlord Krom'gar off a cliff during "To Be Horde...". During “Pursuing the Black Harvest”, Kanrethad Ebonlocke’s Excruciating Agony no longer deals excessive damage. During "The Battle of Sardor", Karonas will once again carry your character across the channel. Fixed an issue where The Defense of Karabor scenario in Shadowmoon Valley would fail to start properly for some players. The Lantern of the Sorcerer King can again be obtained in Mogu'shan Palace for "Relics of the Four Kings”. Fixed an issue where a Mana-Drained Whelpling was visible during "The Withered Return". Summoned Demons should no longer fail to be summoned when the Warlock is on steep terrain or near obstacles such as rocks or trees. Illusionary Mystics in the Proving Grounds again heal for a correct amount of health. Enemies who use Ticking Bomb no longer inflict higher damage than intended. Kosumoth the Hungering should no longer be as hungry. The NPCs in the Grove of the Ancients will no longer offer their low-level quests while players are progressing through "The Warchief's Agenda”. Oil Pumps are now interactable by multiple players at once. Frenzied Wisps will now correctly grant group credit. Creatures throughout Antorus now deal 10% less damage. Smouldering damage reduced by 65%. Several of Imonar’s abilities now deal 25% less damage. Auto-Self-Cauterizer now correctly removes Bleed effects. Toggling War Mode in Orgrimmar or Stormwind should now immediately flag the player for PvP and enable PvP Talents. Unrated Battlegrounds now award item level 185 gear (was 176). Fixed an issue that caused the Glorious Pennant Honor reward to use the same visual appearance as the Esteemed Pennant. Swift Flight Form again correctly travels at the same speed as fast flying mounts. Fixed a bug where Nature's Balance was granting slightly less Astral Power than listed. Twin Moons now correctly interacts with the Lady and the Child Legendary Shoulder armor effect. Healing from Avenging Crusader will correctly be increased if the target has Mystic Touch or Chaos Brand. Fixed a bug where Inquisition would not work correctly together with the Light’s Vanguard Battleplate 4-piece bonus or Divine Purpose. Healing from Atonement will correctly be increased if the target has Mystic Touch or Chaos Brand. Various rare hunter pets around the world are now correctly level scaling again. Prince Navarius’ Soul Blast no longer deals excessive damage. Vile Tutors’ Shadow Shields no longer absorb an excessive amount. Shatug’s Decay now hits for less damage. Blazing Eruption damage reduced by 20%. Sentence of Sargeras damage reduced by 30%. Rent Soul damage reduced by 30%. Withering Roots damage reduced by 60%. Corrupted Healing Totem no longer excessively heals enemies. Immol'thar will now slay the Highborne Summoners after all of the nearby pylons have been deactivated. Tyrant Velhari’s Aura of Oppression's rate of damage increase has been reduced. Lord Vyletongue's Multishot damage has been reduced. Resolved an issue with Helya's Brackwater Barrage which caused some of the visuals to function incorrectly. Defeating the Stone Guard on Raid Finder will award loot correctly if the Jade Guardian is the last to fall. Fixed a bug that made some NPCs have the wrong appearance. Burning Books damage has been reduced to an appropriate level. The Garrison Fishing Shack quests have been updated with the appropriate skill requirement and can once again be accepted and completed. The Universal Language Module is no longer required for "Auctioning for Parts". Fixed an issue where the Lightforged Warframe called from the Vindicaar was unintentionally fragile. Artificer Romuul has replaced its Vindicator Plating, significantly increasing resistance to demonic threats. Fixed an issue where defeating Viz'aduum in Karazhan did not contribute towards earning the Legion Class Hall Leggings. The Twin Spire Ruins graveyard again changes control when one faction brings their Battle Standard to its location. Health of gates has been increased by 100%. Health of NPC generals has been increased by 30%. Demolisher vehicles now deal an appropriate amount of damage. Keep Cannons and Glaive Throwers now deal reduced damage to players. Cloak enchantments from Warlords of Draenor can now only be applied to items with an item level of 151 or lower. Blacksmithing Sharpening Stones and Enchanting Oils have had their max item level requirements updated. Ancient Gem Veins can now be mined with the Outland Mining skill. The Gnomish Army Knife and Ultimate Gnomish Army Knife should now be usable again by engineers. Players with Warlords of Draenor fishing can again catch large fish or Lunkers. Increased experience rewards during the Death Knight introductory quests, allowing them to enter either Burning Crusade or Wrath of the Lich King content immediately after completing the starting experience. Fixed a bug that prevented the completion of “The Felsoul Experiments”. Illidan Stormrage again knows several useful spells during “Ravencrest’s Legacy”. Players can again complete and turn in "The Legend of the Four Hammers". If a new Armorcrafter's Commendation is needed, it is now offered for 1000 Nethershards from Warmage Kath'reen. Fixed a bug that caused Yenniku to sometimes get killed and make “Saving Yenniku” impossible. The Warsong Battle Standard has had its toughness increased in order to survive longer against the Anu'bar Invaders during "The Might of the Horde". Fixed a bug that was preventing the completion of “Wooly Justice”. Fixed several issues in "The Defense of Karabor" that could prevent completion. On "Rocket Rescue", the Pirate-Destroying Bombs will once again wreak their deadly havoc. Fixed an issue where Saurfang did not exercise enough restraint against Warriors dueling him during the quest "Secrets of the Axes". During "A Little Help From My Friends", slapping Ringo will no longer instantly kill him. Rune of the Fallen Crusader and Rune of the Stoneskin Gargoyle are now available at level 55. Dreadwake Armor 2-piece bonus will now correctly reduce the cooldown of Dancing Rune Weapon when a charge of Bone Shield is consumed. Tamed diemetradons are no longer dino-sized. Tiger Style should no longer incorrectly affect Flying Serpent Kick. Avenger’s Shield will correctly interrupt or silence only one target, regardless of effects that add damage targets. Fixed a bug where The First of the Dead did not work with Shadowstrike and Gloomblade. Fixed an issue that caused Riptide's healing to be increased more than intended by Earth Shield. Fixed a bug where Execute with Massacre talent and Whirlwind active could not correctly deal damage. Fixed a bug preventing several spells from correctly granting Soul Leech. Fixed a bug where boosting a Demon Hunter character or using a class trial Demon Hunter equipped the character with rogue gear. Slitherblade Myrmidon's Localized Toxin no longer deals excessive amounts of damage. Singed damage reduced by 75%. Strike damage reduced by 60%. Reduced the health of Fel Hound, Fel Lord, and Felguard. Psychic Assault damage stacks less aggressively. Blazing Imp health reduced by 30%. Pulse Grenade damage reduced by 30%. Stasis Trap damage reduced by 30%. Shadow Blades damage reduced by 50%. Wake of Flame damage reduced by 20%. Carnivorous Bite now does considerably less damage. Reduced General Angerforge's attack damage. Reduced Fineous Darkvire’s attack damage. Shadow of Ebonroc no longer heals for excessive amounts. Reduced the damage done by Gordok Reavers summoned by Captain Kromcrush. Reduced Bronjahm’s damage and the damage increase done by Magic's Bane to casters. Reduced Anhurr's Divine Reckoning damage. Fixed an issue where Ga'dok would fall and despawn. Unmanaged Aggression now does considerably less damage and provides less haste. Shadow Hunter Vosh'gajin’s Curse of Blood no longer increases damage taken by an excessive amount. Piercing Tentacle no longer does excessive damage. Reduced the damage done by Gekkan and his associates. Fixed a bug where The Spirit Kings could sometimes unintentionally respawn. Dargrul’s Crystal Spikes no longer incorrectly prioritizes tanks. The healing amount of Vampiric Aura has been reduced to 10% of the target’s health. Feast of Blood now activates Vampiric Aura (was an increase to Vampiric Aura). Reduced the damage of Drakos the Interrogator’s Sphere Detonation and melee attacks. Centurion, Pyrelord, and Core Hound creatures summoned by Backup Singer should no longer have excessive health. Exploding Shot Stalker no longer deals excessive damage. Scorched Earth no longer deals excessive damage. Demonic Obelisk should no longer deal excessive damage. Vehicle power scaling adjusted to better fit post-squish item levels. Swamplord Muselek no longer deals excessive damage. Ingvar the Plunderer’s Dark Smash and Dreadful Roar no longer paint his face with as much of your blood. Reduced the damage done by Altairus' Chilling Breath and Lightning Blast. Sticky Bomb damage has been reduced. Mecha-Blast Rocket damage has been reduced. Gunpowder Charge damage has been reduced. The item Net-O-Matic 5000 should work in Stormwind and Orgrimmar on targets who are flagged for PvP and have War Mode enabled. The rate at which Hammer of Reckoning stacks are gained has been reduced to 1 stack per 5% of the Paladin's maximum health in damage. Crowd control spells that immediately break on damage such as Polymorph and Freezing Trap will now remove Shadow Mend's damage over time effect in PvP combat. Fury Warriors can no longer continuously cast Heroic Leap when they have the Honor Talent Barbarian. Barbarian will correctly interact with the additional Heroic Leap charges granted by Timeless Stratagem. Fixed a bug with the Emergency Fire Ward on “Bael’dun Rescue”. “The Stolen Silver” can again be properly looted when clicking on the Stolen Silver Lockbox. Enemies no longer do excessive damage in “The Defense of Karabor”. Gymer should now be better at surviving throughout “The Storm King’s Vengeance”. Bone Armor now more substantial and effective on “Ever Watching From Above”. The Great Northern Elderhorn should no longer vanish during the Leatherworking quest “Mounting Made Easy”. Fixed a bug where Thrall would not complete the Hour of Twilight event if Arcurion was killed quickly. The Forest’s Edge bounty board again offers “WANTED: Hogger”. Horde players can again use the Sunreaver Portal during "Insertion". Fixed a bug causing the spell Soul Blast to deal too much damage during "The Storm King's Vengeance". Enemy machine gun fire no longer deals excessive damage on “The Pride of Kezan”. Fixed a bug preventing the turn in of "Captain Sanders' Hidden Treasure". The Earth and Fire clone from Storm, Earth, and Fire should correctly mimic Rushing Jade Wind, regardless of the player’s target. Fixed a bug preventing the Light’s Vanguard Battleplate 4-piece bonus from activating and deactivating as intended. Fixed an issue where Consecration occasionally failed to provide its self-buff. Fixed a bug where Blindside was not learnable until level 40. The Command Demon version of Spell Lock can no longer be cast without a target. Demonic Calling can now correctly be activated by casting Demonbolt. Characters at level 110 and above may now move up to 1,000,000 gold when performing a Character Transfer. Fixed a visual bug that caused some characters to lose the tops of their heads. The health and damage of all enemies in Emerald Nightmare, Trial of Valor, The Nighthold, and Tomb of Sargeras has been significantly reduced. The experience awarded on completion of a random dungeon has been increased. Fixed a bug preventing Death’s Advance from functioning correctly in certain encounter situations, such as Aggramar’s Flame Rend. Damage dealt by Lightning Strike, Warlord Parjesh’s Crashing Wave, and Quicksand have been significantly reduced. Chaotic Energy Bursts from Chaotic Rifts no longer inflict excessive damage. Sartharion’s Large Satchel of Spoils should again contain loot. Mana Confluences’ Ablative Shield should no longer absorb an excessive amount of damage. Dragonflayer Runecaster’s Bolthorn's Rune of Flame now deals less damage. Darkmoon Deck: Promises no longer reduces some non-mana resources. Fixed a bug that prevented banners from granting expected honor, experience, and reputation bonuses. Fishing Chair and Nat's Fishing Chair have been temporarily converted into objects that are not chairs, while a bug with their functionality is fixed. They will return to their former function in a future patch. Adjusted PvP scaling to reduce the difference in power and damage between players of different item levels at level 110. Fixed a bug preventing some players from obtaining Honorable Medallion while PvP-enabled. Fixed a bug that caused the wrong sound when casting. Fixed a bug with the reputation bonus on completion of "Death to Agogridon". If you previously completed the quest, speak to Karnum Marshweaver in Desolace to receive your reward. The talking quest NPC should no longer appear for players who are nearby, but are not the Hunter on “Never Hunt Alone”. Players should again be able to complete “All Charged Up”. Fixed a bug with the conversation required for “Secrets of Wrymskull Uncovered”, allowing completion of “The Echo of Ymiron”. Low-level players are now able to do appropriate damage to the Devilsaur Queen during "The Ballad of Maximillian”. “Pitching In” can again be completed. It is again possible to earn credit toward "Field Photographer" when using the S.E.L.F.I.E. cam anywhere within the Path of Uther. Alliance characters can again complete "Uther's Blessing" by approaching Uther's statue. Gravewarden Armaments 4-piece set bonus now reduces the cooldown of Army of the Dead by 2.0 seconds per Rune spent (was 6.0 seconds per Rune spent). Serpenstalker Guise 2-piece set bonus has been changed to increase all physical damage dealt by 5% (was an incorrect melee attack power increase). The Trick Shots effect will now always correctly apply when Multi-Shot hits three or more targets. Shimmer should not interrupt channeled spells. Displacement functions correctly if you cast Shimmer while casting another spell. Juggernaut Battlegear 2-piece set bonus has been changed to increase Armor by 5%. Damage dealt by all creatures below level 100 has been reduced by up to 25%. Defeating Shok’Thokar creatures in Desolace now grants both Gelkis and Magram reputation. The Sky Crystal no longer instantly kills Alani when used by a high-level player, and Alani is once again lootable. Reduced the damage done by a number of "tank swap" abilities throughout the zone. Reduced the damage dealt by Sweeping Scythe by 30%. Volatile Magic damage reduced on Mythic difficulty. Whirlwind should no longer deal excessive damage. Casting spells within Shek’zeer’s Dissonance Field once again depletes its energy. Corrected an issue that caused Dargrul’s energy to refill too rapidly. Soul Siphon no longer heals for an excessive amount. Piercing Missiles should no longer deal excessive damage. Bloody Mess should no longer deal excessive damage. Dashing Strike no longer deals excessive damage. Reforged Hammer of Ancient Kings should again reliably drop from Yogg-Saron for "Val'anyr, Hammer of Ancient Kings". The effectiveness of trinkets that are obtained via PvE sources such as Dungeons and Raids have been reduced by 75% in PvP. Corrected the amount of damage dealt by players to creatures and vehicles in Alterac Valley and Isle of Conquest. Fixed a bug that prevented end-of-match rewards from dropping at the end of Battlegrounds and Arenas. Premade Group Finder groups in the Quest and World Boss categories will now properly filter listing according to the War Mode state of the party leader and potential applicants. Fixed a bug that prevented several First Aid recipe items from requiring the appropriate Profession. Corrected an issue that could cause Draenor Garrison NPCs to fail to offer work orders. Fixed a bug preventing players from discovering new Pandaren Alchemy recipes. Some older-expansion flasks no longer provide more stats than Legion flasks and potions. The cooking achievement Dinner Impossible no longer requires Strand of the Ancients. Fixed a bug that prevented some players from gaining Legion fishing ranks when using rare fish. Fixed an issue that could cause herb nodes from Outland through Pandaria to yield the wrong herb type. Corrected an issue that could cause players to receive no ore from mining nodes. The start of the Mage Tower artifact storyline quest no longer requires an impossible-to-meet artifact trait condition. Fixed an issue that could cause Strom’kar to be invisible to certain races during its acquisition. The Slitherblade Naga vehicle's abilities should now deal damage and heal properly on "Wetter than Wet". The Frightened Miner should now reliably follow his path for "Miner Troubles". The delicious contents of Yak’s Milk Flask again heals “Fallen Sentinels”. Wyrmcult Blackwhelps can now be collected for "Whelps of the Wyrmcult". General Nazgrim is again present for "The Art of War" and "Warchief's Command: Jade Forest". During “Bringer of the Light” at the Exodar, Fel Annihilator’s Sonic Boom no longer deals excessive damage. Chaos Brand correctly has unlimited duration outside of PvP. Tranquility’s heal-over-time can correctly critically heal. Explosive Shot will now correctly despawn if the projectile collides with an obstacle or reaches maximum range, and refund partial cost and cooldown. Mystic Touch correctly has unlimited duration outside of PvP. Soul of the Archmage now grants the talent Amplification (was Temporal Flux). When Arcane Missiles activate Clearcasting, the subsequent (free) Missiles will correctly have reduced channel time and be affected by Slipstream. Psychic Horror is correctly usable below level 74. Soul of the Farseer should now correctly grant the talent Echo of the Elements. Wrath of the Creators should no longer deal excessive damage. Lady Deathwhisper again has an appropriate amount of mana. Alzzin the Wildshaper’s Wild Generation should no longer heal for an excessive amount. Fixed a bug causing Eredar Deathbringer to deal much more damage than intended. Fixed a bug causing centaurs in Desolace to deal more damage than intended. Druids can again interact with Skycaller Faeb. Honor and Conquest rewards for Epic Battlegrounds have been increased. Corrected the display of ranks in Profession recipe windows. The Staff of Pei-Zhi can again be looted for “An Urgent Plea”. Fixed a bug preventing the completion of some Garrison campaign quests in Draenor. In Highmountain, Small Ceremonial Drum can again be interacted with for "Ceremonial Drums". Merchant Greenfield again gives the player seeds for "Learn and Grow I: Seeds". Fixed a bug preventing Kol Ironpaw from grilling the Bloody Plainshawk Leg for "A Gift for Fung". It is again possible to collect Fizzle’s Hand for “Fizzled”. Aprika’s Doll can again be collected for “Small Comforts”. Players can again interact with Mana-Drained Whelplings for "Their Dying Breaths". The Eye of Kilrogg is again obtainable for “Eye See You”. The Soulweave Vessel can again be looted for “The Cure For Death” and “Vessel of Virtue”. Legion Assaults now correctly scale down to player level 98.